The staff where OUTSTANDING. My wonderful wife required a little special diet items, the wait staff went out of their way to take care of it on a daily bases( even while serving 3,000 others). 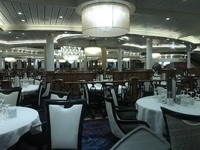 Like all our RCCL cruises the food quality was very good. We generally ate breakfast and lunch at the buffet , we loved the many choices available and it was done well. We ate our dinners in the MDR. We had anytime dinning and we were able to sit in the same waiters section each of the 13 nights. We really enjoyed the food but , I must say , doing a 13 day cruise the choices seemed a little repetitious . We enjoyed the layout of the ship, seems very similar to Freedom. The nightly entertainment for us was only so so. Even though we had major faul weather in Canada we really enjoyed the itentery , we’d like to go back agin. The staff where OUTSTANDING. My wonderful wife required a little special diet items, the wait staff went out of their way to take care of it on a daily bases( even while serving 3,000 others). Like all our RCCL cruises the food quality was very good. We generally ate breakfast and lunch at the buffet , we loved the many choices available and it was done well. We ate our dinners in the MDR. We had anytime dinning and we were able to sit in the same waiters section each of the 13 nights. 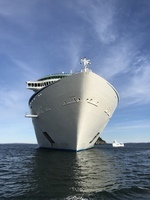 We really enjoyed the food but , I must say , doing a 13 day cruise the choices seemed a little repetitious . 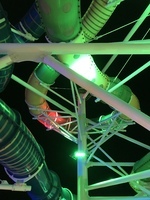 We enjoyed the layout of the ship, seems very similar to Freedom. The nightly entertainment for us was only so so. Even though we had major faul weather in Canada we really enjoyed the itentery , we’d like to go back agin. Cabin was clean and well serviced. The shower seemed a little bigger the our last cruise when we where on Princess. This was the 1st time we had an inside cabin sense the mid eighties, didn’t miss the balcony or window one bit. We want to go back when we aren’t limited to time of cruise ship stops. Faul weather prevented us from seeing much of anything. Met distant cousin for 1st time, spent the day with him and his wonderful wife. Beautiful island , lots of undeveloped land. We walked to the Citadel and toured it. Had a wonderful lunch on the bay. Is home. We exited the ship a day early as to not have to drive up from Lauderdale the next day. We were told about 400 passengers where exiting like us. Got to see President Bush’s house ( from a distance of corse ) . Beautiful area! Go back when not cruises and spend time. Didn’t find to much to do here, without having to do a tour that drives for over an hour each way and stays at the destination for 20 minutes. Rough weather didn’t allow the ship to stop at this port.